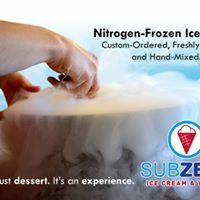 Visit Sub Zero Ice Cream & Yogurt in Nashua for a dessert experience like nothing you’ve ever tasted before. Customize your own delicious ice cream creation with fun flavors and yummy mix-ins. Then sit back and watch as we flash freeze it using liquid nitrogen, transforming it into the freshest, smoothest ice cream right before your eyes! First, choose what kind of cream your ice cream is made from. If you are an ice cream connoisseur looking for a rich, smooth texture, then you’ll love our original or custard. We also have low-fat and yogurt options as well as lactose free, vegan and sugar free options for those with dietary restrictions. Next, choose from over 50 flavors. Mix them to create bold, unique and delicious flavor combinations. Then add mix-ins to enhance your selected creation. Choose from a wide variety of fruit, candy, nuts and baked goods to satisfy all cravings! Then watch as we transform your mixture into the best, creamiest ice cream you’ve ever tasted! Got an event coming up? Weddings, birthdays, corporate events, holiday parties and more -- Let Sub Zero Ice Cream & Yogurt cater your event, and we will provide a culinary experience your guests will never forget. Do you want your child to be the hero for the day at their school? Have them talk to their science teacher about asking Sub Zero Ice Cream & Yogurt to come to their school where we will provide a half hour science presentation about the states of matter, the ideal gas law, evaporation, condensation and all the fun science behind this awesome ice cream. It's Fresh, It's Delicious, It's Science! You've got to see it!